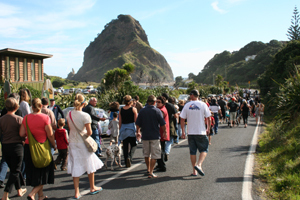 Piha R&R committee meetings are not open to the public but at all normal monthly meetings a time will be set aside early in the meeting for ‘Open Forum’ when any interested parties may present issues to the committee and elected representatives may provide information or updates on issues of interest to the Committee and/or the Community. While notice of any intention to speak in Open Forum is not a requirement, it is recommended, to ensure adequate time allowance is made. The normal maximum speaking time is five minutes unless the committee approves otherwise. Committee members may ask questions at the conclusion of any presentation. No resolution will normally be made at the time of the presentation, but committee members may be asked to follow up the presentation with further investigation. This will come back to a subsequent meeting. Open Forum speakers and/or Visitors may not verbally criticise committee members or question or debate with elected members while the meeting is in progress.